Welch Allyn Vital Signs Monitors : Medical Thermometers : ECG Equipment : EKG Machines : Pulse OX : Ambulatory Blood Pressure : Fetal Dopplers : Schiller Monitors : Medical Device Depot, Inc. The Connex VSM is an advanced, touch screen monitor featuring bright, vivid colors with minimal knobs or buttons for ease of cleaning—perfect for general care floors within the hospital and also for surgery centers and other ambulatory care offices. The 6500 is a standard unit with 4 host USB ports for accessories, an Internal 802.11 a/b/g wireless Radio, nurse call and radio ready features. 6700 is a standard unit 4 USB ports for accessories, Nurse Call, Radio Ready. NIBP and SpO2 standard. Spot-Check, Triage, Intervals Monitoring and Continuous Monitoring Profile included. Respiration option not included. 6700 is a standard unit 4 USB ports for accessories, Nurse Call, Radio Ready. NIBP and SpO2 standard. Spot-Check, Triage, Intervals Monitoring and Continuous Monitoring Profile included. All models include EarlySense contact-free monitoring. 6700 is a standard unit 4 USB ports for accessories, Nurse Call, Radio Ready. NIBP and SpO2 standard. Spot-Check, Triage, Intervals Monitoring and Continuous Monitoring Profile included. All models include Masimo Acoustic Respiration Monitoring. 6700 is a standard unit 4 USB ports for accessories, Nurse Call, Radio Ready. NIBP and SpO2 standard. Spot-Check, Triage, Intervals Monitoring and Continuous Monitoring Profile included. All models include Covidien(R) Capnography. 6800 is a standard unit 4 USB ports for accessories, Nurse Call, Radio Ready. NIBP and SpO2 standard. Spot-Check, Triage, Intervals Monitoring and Continuous Monitoring Profile included. All models include internal 802.11a/b/g wireless radio and EarlySense contact-free monitoring. 6800 is a standard unit 4 USB ports for accessories, Nurse Call, Radio Ready. NIBP and SpO2 standard. Spot-Check, Triage, Intervals Monitoring and Continuous Monitoring Profile included. All models include internal 802.11a/b/g wireless radio and Masimo Acoustic Respiration Monitoring. 6800 is a standard unit 4 USB ports for accessories, Nurse Call, Radio Ready. NIBP and SpO2 standard. Spot-Check, Triage, Intervals Monitoring and Continuous Monitoring Profile included. All models include internal 802.11a/b/g wireless radio and Covidien Capnography. The Connex® Spot Monitor features an easy-to-use, vivid touchscreen display and provides accurate vital signs measurement including blood pressure averaging, spot checking, interval monitoring and custom scoring across patient populations. The device connects wirelessly to your EMR and accurately sends vitals to the patient chart from the point of care to help improve efficiency. It offers an upgradeable design and custom configurations including a choice of thermometry and/or pulse oximetry, connectivity and mounting/mobility options. In addition, the new Accessory Power Management Stand with WhisperDrive™ technology features additional power backup, providing up to 17 hours of on-time, alleviating the need to charge the monitor as frequently. 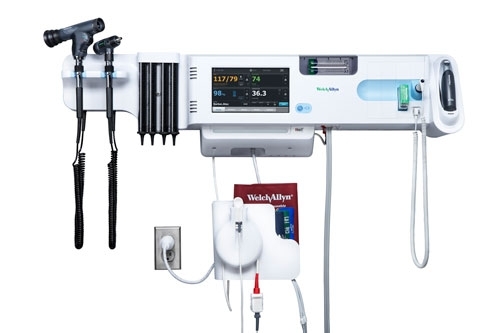 The Welch Allyn Connex® Integrated Wall System (Non-Wireless) is an advanced vitals management and physical assessment solution that combines all necessary exam tools in one convenient system—allowing clinicians to take and electronically capture accurate patient vital signs and perform basic diagnostic exams. The integration of vital signs management and physical assessment tools in one system helps enhance clinical decision-making, improves patient safety and saves valuable time.